Right above Stoupa, about 400 meters from Kalogria beach and maybe another 400 meters away from Stoupa's main beach you'll find the Kolokotronis Village. All holiday houses are new, some brand new, built in a traditional way from natural stone and due to their location on the slope of a hill, they all got marvelous sea and mountain views. The whole area was carefully set up with much love for the detail. Narrow, stone paved alley ways with steps inbetween the houses and everywhere flowers under green bushes and trees. At the entrance, beside the reception, is a big swimming pool with hydro-massage and a small shallow childrens pool for all residents with shady places to rest. The adjoining bar serves snacks and drinks. The 'Royal Suites' are without any doubt the Villas at the top of the village. Two sleeping rooms with large, sunny balconies and the bathroom can be found in the first floor, the large living room with large, shady Verand and with another three sleeping possibilities on transformable sofas plus the separated kitchen is located in the first floor. There also is another toilet room. The villa is generously equipped, has telephone and is fully air conditioned. The pool in front is reserved for the tenants of the villas. Besides these villas smaller vacation houses are available: With their separated sleeping room and the living room with integrated kitchen it sleeps up to 4 people. Likewise these houses are equipped with telephone and air conditioning. 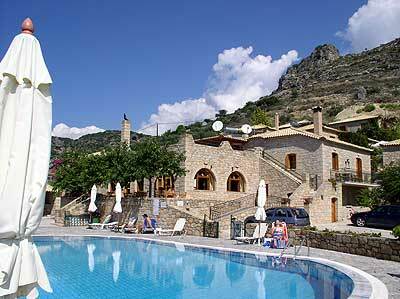 On offer are also some 1-room Apartments in the lower part of the village for up to 3 people. All houses are nicely equipped and feature a fitted kitchen, telephone, air conditioning, satellite television, internet connection, safety deposit box and room service.